The purpose of this experiment was to communicate the results of our research in a scientific presentation with a clear and consistent message along with making and practicing the presentation with our partners. Also to determine if virus copy number correlated with diversity and divergence while using Biology Workbench to illustrate findings. Answer your research question from Week 4 using the bioinformatics tools with which you practiced during the in-class activities for Weeks 3 and 4. 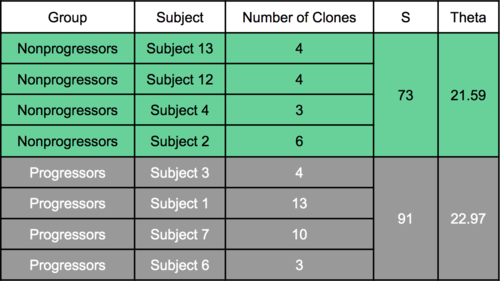 Create a multiple sequence alignment and tree using ClustalW. Also use one of the statistics, S, θ, or the Min and Max distances (or some other statistic mentioned in the Markham et al. (1998) paper). Use the annotated bibliography from this week to interpret your results in light of the data in the more recent papers you found. Prepare a presentation that you will give in class for Week 7 (October 11) showing the results. This week's project was slightly frustrating because the experiments Avery and I conducted showed no real significance in the data. We hypothesized that subjects with similar viral load numbers would have low genetic diversity, theta, and S levels. However, the data reflected that this is not the case. However, what is important to take away is that just paying attention to viral load number is not a dependable way to determine genetic diversity, and that is telling information in itself. From this, we know that to proceed we have to find a different way to track and understand genetic diversity of the virus across subjects. CLUSTAL W: Julie D. Thompson, Desmond G. Higgins and Toby J. Gibson, modified; any errors are due to the modifications. PHYLIP: Felsenstein, J. 1993. 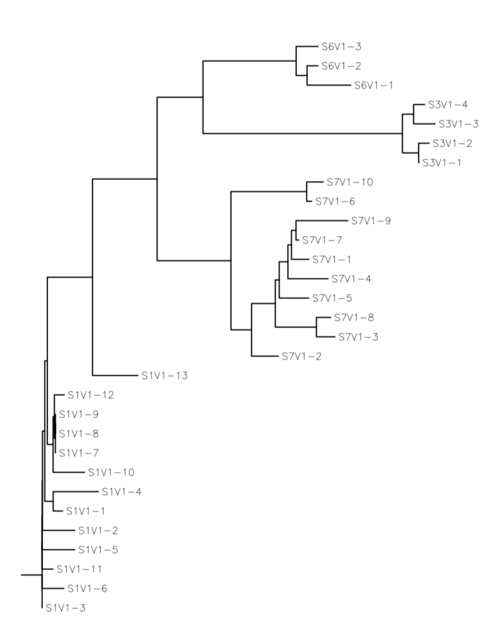 PHYLIP (Phylogeny Inference Package) version 3.5c. Distributed by the author. Department of Genetics, University of Washington, Seattle. Rinaldo, C., Huang, X. L., Fan, Z. F., Ding, M., Beltz, L., Logar, A., … Cottrill, M. (1995). High levels of anti-human immunodeficiency virus type 1 (HIV-1) memory cytotoxic T-lymphocyte activity and low viral load are associated with lack of disease in HIV-1-infected long-term nonprogressors. Journal of Virology, 69(9), 5838–5842. This page was last edited on 9 October 2016, at 19:58.